Sometimes you find yourself shopping for a family that you might not know particularly well or kids that you don't get to see all the time but you still want to send them a little gift. Books with amazing illustrations can be appreciated by a wide range of ages (and adults) and make great additions to anyone's home library. If you happen to be shopping for kids you don't know very well, gorgeous picture books are a good sure bet and I tried to select these with that audience in mind. Bonus: these are also wonderful gifts for kids you do know very well and see all the time! I'm including books here that I particularly love for their illustrations. I know that everyone's tastes are different, so the Caldecott winners and honor books are great resources for choosing your own gorgeous picture books if you don't happen to share my taste. 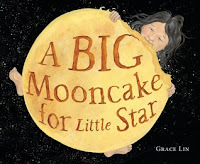 A Big Mooncake for Little Star by Grace Lin (Little Brown, 2018). Grace Lin is one of my favorite authors and her striking illustrations in this book make this one of my favorite picture books of the year. The story is a whimsical telling about the origins of the phases of the moon as one little girl can't stop herself from sampling the big mooncake her mother told her not to touch. Blue Sky, White Stars by Sarvinder Naberhaus, illustrated by Kadir Nelson (Dial, 2017). 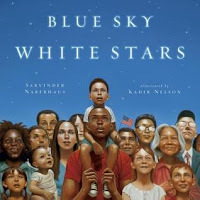 You can't go wrong with Kadir Nelson's brilliant oil painting illustrations, and he's illustrated a ton of books. You should definitely check them all out, but I think this one in particular has a wide general appeal as it presents different iconic American images. 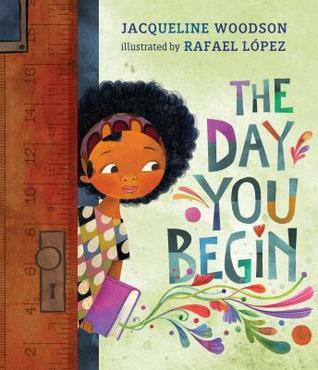 The Day You Begin by Jacqueline Woodson, illustrated by Rafael Lopez (Nancy Paulsen Books, 2018). This gorgeous picture book is a universal story of a child feeling like they don't quite fit in with everyone else. It's a feeling that most can identify with and this will be an especially poignant read for families with elementary school children. 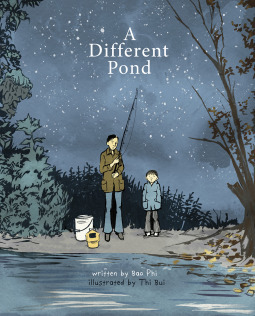 A Different Pond by Bao Phi, illustrated by Thi Bui (Picture Window Books, 2017). This Caldecott-Honor-winning title is a great choice for families with elementary school children as it examines the life of an immigrant family. Paintings in blues and yellows set the scene as a boy and his father fish for their supper and the father tells his son about a different pond in his home country of Vietnam. 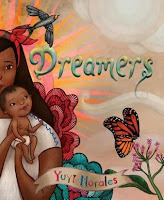 Dreamers by Yuyi Morales (Neal Porter Books, 2018). A love letter to a new child, a story from a parent to their progeny, this is a story of one mother's journey to America, everything she left behind and everything she brought with her. The idea of dreaming of a better future for your family is universal and this is a story that celebrates those who have made their home in a new place. The colorful, dreamlike art makes this book stand out. Dusk by Uri Shulevitz (Farrar, Strauss, & Giroux, 2013). This is a picture book that I always think of this time of year when the days grow shorter. I love the stunning sunset colors and the quiet peace that this book portrays. 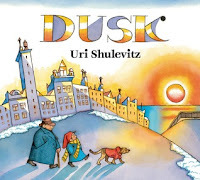 I also love Shulevitz's Snow for another gorgeous book that evokes the winter season. 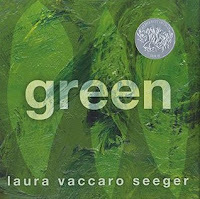 Green (Roaring Brook, 2012) and Blue (Roaring Brook, 2018) by Laura Seeger. I have long loved Green, a treatise on different shades of green, and this year Laura Seeger released Blue along the same lines. 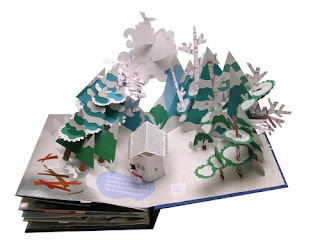 These would be particularly good choices for children or families who are into art, but the strong vocabulary and stunning artwork makes this a great choice for preschool children in general. 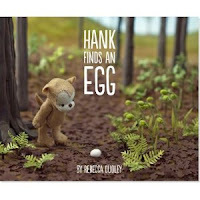 Hank Finds an Egg by Rebecca Dudley (Peter Pauper Press, 2013). Maybe more cute than outright gorgeous, this is still a picture book that kids of all ages will love poring over to see all the miniature stuff that Rebecca Dudley created and posed to make this picture book. 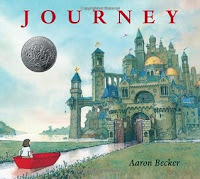 Journey by Aaron Becker (Candlewick, 2013). 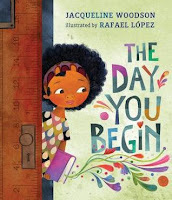 This wordless picture book, the first in a trilogy, shows a young girl drawing a door on her bedroom wall and going through it to have a marvelous, whimsical journey as she creates different vehicles to carry her on her way. The trilogy continues with Quest and Return, each just as gorgeous and perfect to buy together for a full set. Martin Rising by Andrea Davis Pinkney and Brian Pinkney (Scholastic, 2018). 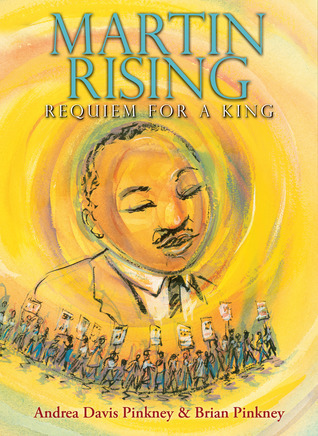 This book of beautiful poetry and art is about the life and last days of Martin Luther King, Jr. It's not an easy read, but it's a poignant addition to home library shelves, particularly those with older elementary and teen readers. Even though it's a heavily illustrated book, the serious subject matter makes this a moving read even for parents who might want to read this along with their children. Robert Sabuda books. Robert Sabuda is the name to know when it comes to intricate pop-up books. All of his books are stunners and he's designed a ton of them. Be wary about buying these for young children - they're super intricate and will not hold up to heavy handling - but for families with older kids these are sure bets and parents will love them as much as the kids. Whether you're buying for a child you don't know too well or a child you see every day, any of these books would make a great addition to home library shelves.